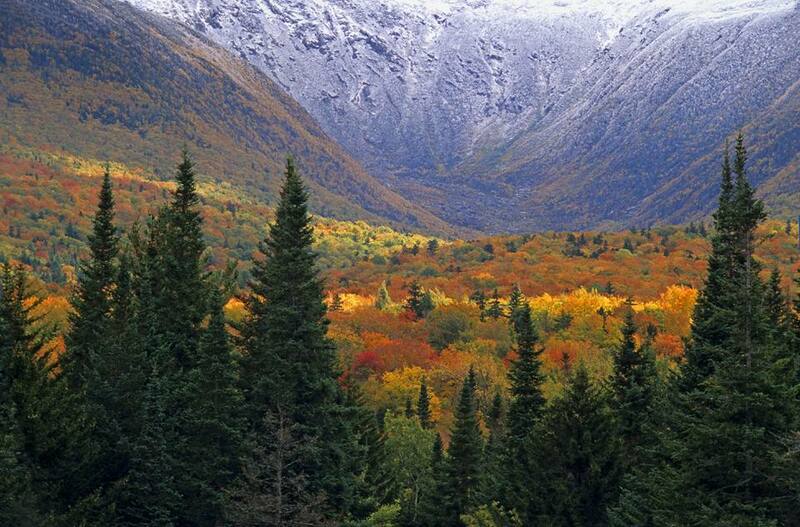 The White Mountains in northern New Hampshire seem designed to appeal to vacationers of all stripes. This is New England's most enchanting destination for families with little kids, and the region — with its cozy inns and nearly 800,000-acre White Mountain National Forest — is alluring for couples and adventurers, too. During all four seasons, there are experiences here you'll find nowhere else in New England. Here are 10 that should top your list of things to do while you're in the White Mountains. "The Kanc"—Route 112 through the White Mountain National Forest—is New England's pinnacle sightseeing drive, particularly when fall foliage peaks. Connecting Conway and Lincoln, New Hampshire, the winding, 34-mile road built in 1959 will take you longer to traverse than you might expect. Not only is traffic heavy at peak times, there are attractions galore that will tempt you to pull over and explore including scenic overlooks, waterfalls, a covered bridge and the Russell-Colbath Historic Site. The White Mountains have been a merry place for kiddies since 1953, when Santa's Village opened with a handful of enchantments including pony rides, real reindeer and Santa and his elf entourage. A year later, the fairytale-inspired Story Land debuted. Fast-forward to today, and you'll find both amusement parks delighting a new generation of children each summer with throwback and new rides, shows and interactive experiences. While the focus is on the under-10 set, both parks can be magical for anyone who believes in the wonder of classic children's stories and the holiday season. Santa's Village even reopens on weekends between Thanksgiving and Christmas for frosty fun. The most popular of New Hampshire's alpine ski areas are here in the White Mountains, so whether you're a black diamond skier or a bunny hill beginner, consider spending time in the exhilarating outdoors if you're visiting in the winter. Bretton Woods is the state's largest ski area, Cannon Mountain its highest and arguably most challenging. And families flock to Attitash, Loon Mountain, Waterville Valley Resort and Wildcat, too. Then there's Tuckerman Ravine: in a daredevil class all its own. Once the snow melts, these ski areas all reinvent themselves with summer attractions that range from Attitash's Mountain Coaster to Loon's Aerial Forest Adventure Park. In the fall, ski area chairlift rides are a thrilling way to leaf peep. Don't miss your chance to travel to the 6,288-foot summit of New England's tallest mountain aboard the world's first mountain-climbing cog railway: an incredible feat of Yankee ingenuity completed in 1869. The train ascends the steep, 3-mile track in about an hour, and you'll have an hour to explore the summit — which is often snowy even in the summer months — before your visually thrilling descent. While you're on Mount Washington, you'll have a panoramic view spanning the mountains and valleys of New Hampshire, Maine and Vermont, and, on clear days, you can see north into Canada and east to the Atlantic Ocean. In the winter, trains travel halfway up the mountain to Waumbek Wonderland. A beloved roadside attraction for more than 90 years, Clark's Trading Post is a multifaceted destination best known for its humor-filled trained black bear shows. There's much more to see and do, though, including scenic train rides, history and Americana museums, a Segway park and safari, Merlin's Mystical Mansion, bumper boats and a water raft ride. Visit Memorial Day weekend through mid-October, and enjoy all of the shows and activities for one ticket price. Even as more and more ziplines have opened in New England, the Bretton Woods Canopy Tour remains one of the ultimate thrills. The experience features two sky bridges, three rappels and 10 ziplines, and the fact that this three-and-a-half-hour course is open year-round makes it an adventure you'll return to as the seasons change. The White Mountains views you'll have as you play up in the trees are unmatched. And your guide will ensure not only your safety but a successful bonding experience with family or friends. Even on New Hampshire's hottest summer days, this attraction's underground river, waterfall and series of caves are cool to explore. Discovered more than a century ago, this natural wonder is open seasonally for self-guided tours by day and guided lantern tours at night. Kids can complete a quiz to earn a Junior Gorge Guide sticker and reward at the end of their visit. Even if you haven't made reservations for the night (all-inclusive packages include lodging, meals, activities and gear), stop into the Appalachian Mountain Club's Highland Center Lodge in Crawford Notch. On the front lawn, you'll find a high-powered telescope that allows for solar observations by day and stargazing when the skies go ink dark at night. And that's just the start of free public offerings year-round. A network of trails for hiking or snowshoeing is accessible from the lodge, and you can participate in a variety of guided adventures and educational programs. When you outlet shop along Route 16 in North Conway, you'll save twice. That's because factory store deals are an even bigger bargain in sales-tax-free New Hampshire. Settlers Green, with more than 80 name brand outlets, is a good place to start your shopping spree. Don't miss the L.L. Bean Outlet, where you'll find surprisingly low prices on apparel, shoes, sporting goods, household decor and more from the famous Maine-based retailer. Got kids? Like to get them all dolled up? Then visit The Wooden Soldier outlet store to save on fancy dresses for girls and sharp outfits for boys. Want to weatherproof your White Mountains family getaway? Book a stay at the Red Jacket Mountain View Resort in North Conway: home of the largest indoor water park in New Hampshire. Kahuna Laguna is tropical year-round, with a wave pool, slides, water cannons, a tipping bucket and more fun for all ages. Although it is smaller, the Hampton Inn & Suites in North Conway also has a year-round indoor water park for guests. Both properties have pet-friendly rooms (but, no your dog can't splash around in the park).